This year, I finished one chapter in my career and began writing a new one. My time as a member of Northumbria University’s Creative Fuse North East Innovation Delivery team came to an end, and I began in the role of Design Strategist at Grid Smarter Cities. Grid creates digital products that enable the smart management of cities; such as freight traffic control, parking, goods and services. 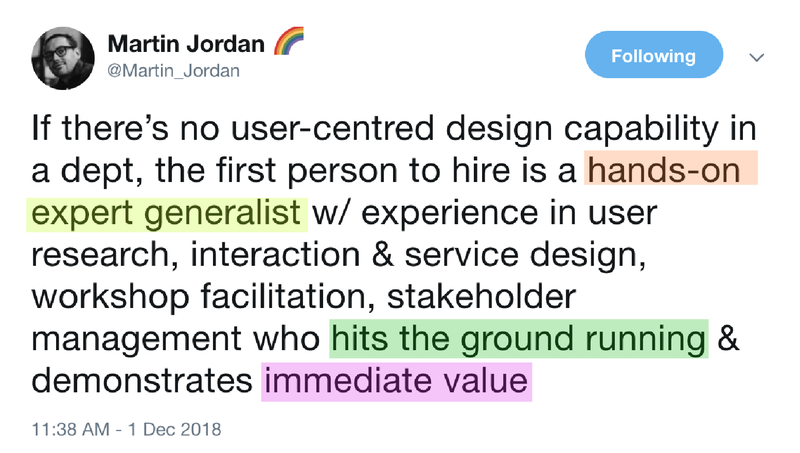 Grid has a relatively small team and I am very much the first of my kind (design thinking, service designer) within the organisation. This was one of the main attractions of the job; the opportunity to guide, co-develop and implement design within the product development process and the wider organisation. Recently I came across two tweets from fellow practitioners on Twitter. One of the initial challenges was getting to grips with the new context I now work within. I have had to learn and adjust to working in a smaller organisation, and also a new sector. This was daunting and certainly knocked my confidence early on. To remedy this, I found there is no shortcut. I immersed myself in countless government reports, I read blogs from sector experts and fellow practitioners, I watched youtube videos, I read patent applications. I went completely down the rabbit hole and stayed there until I felt I had a competent understanding of the basics. Smart Cities are a typical design thinking problem/opportunity; they are complex, networked and dynamic. To be able to effectively design for them, you have to be able to toggle between the macro (city-wide vision) and the micro (citizen experience). You have to be able to regularly switch contexts and the frames you view the problem/opportunity if you want to create a holistic solution. Whether it is in a workshop of project stakeholders, with an internal sprint, or in an interview with users, we have to be great facilitators. We have to be able to motivate, excite and communicate with people so we can gain as much insight into their experience as possible. Being the first within the business to practice UX/Service design, I am leading the charge. Not only am I responsible for carrying out the day to day tasks but I also need to ensure my colleagues buy in to and embrace the value of design. For me, there’s only one way to do so, be proactive and take the initiative and more so, contribute. Offer suggestions and ask questions in discussions, frequently share your work as it develops, share relevant resources (such as the recent McKinsey Report). As design thinkers and doers, we have a broad skill set that can immediately help an organisation, we can help visualise abstract concepts; such as the organisation’s current process. 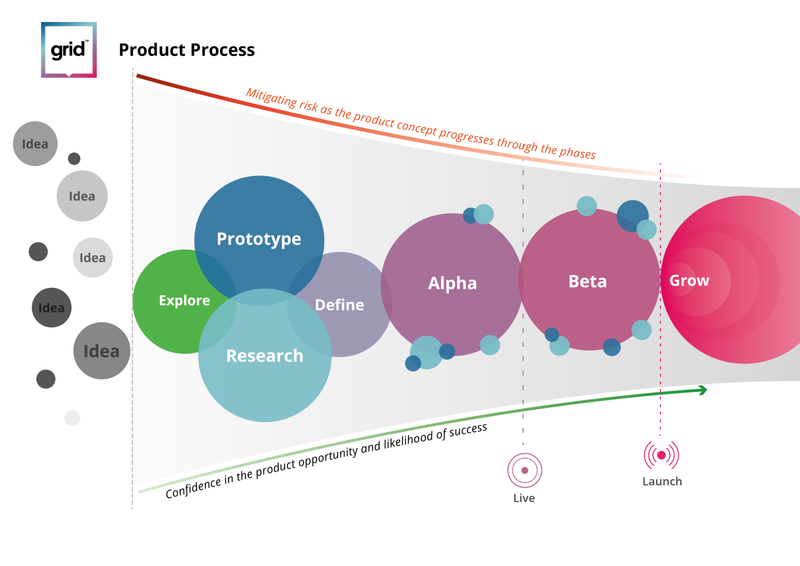 The illustration I co-created with the team to visualise our product development process. We can develop and refine presentation materials. Or we could deconstruct a current product/service, identifying gaps in the experience. However, I think one of the biggest ways to have an immediate impact is to ask questions about everything to everyone; the organisation, the products, the culture. Not only do you improve our own understanding but you spur everyone in the organisation to get involved in a conversation. 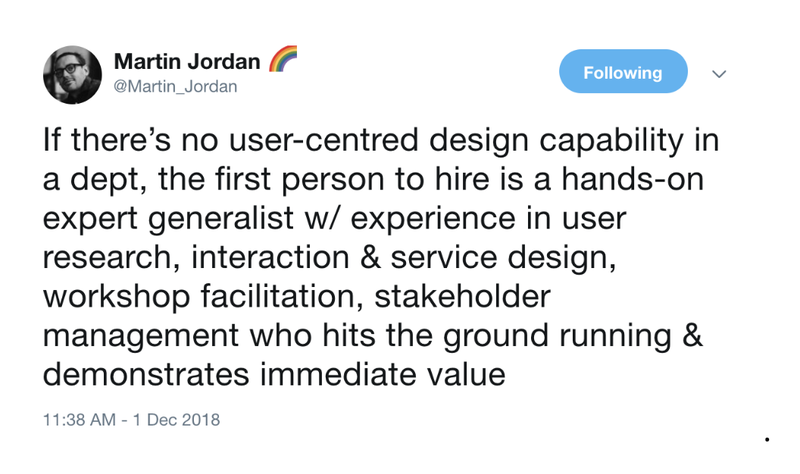 Service design and design thinking effectiveness is dependant on working across disciplines, functions and teams so, I’m going to need my colleagues to buy into my work. For this, I need to build meaningful relationships and a level of personal trust. Take the time to speak regularly with your colleagues, not only about the job but their interests, their points of view on the wider world. This will help you understand what makes them tick and how to communicate with them so when you need to get support or collaboration, you know the best way to approach them. My way of working is sketch-heavy and expansive, this was reflected in my early equipment request; a pack of A0 flowchart and a pack of Papermate Flair M. The biggest question I had though, wasn’t about my equipment, it was: Do I have autonomy and control over the office space? A big part of my approach is populating space with physical materials. I was told, “don’t break anything and don’t mark the walls, the rest is fair game”. This was music to my ears. To the right of my desk, I have a wall where I think out loud. There is everything from policy documents, academic research papers, to initial ideas about the framework I want to define and implement. 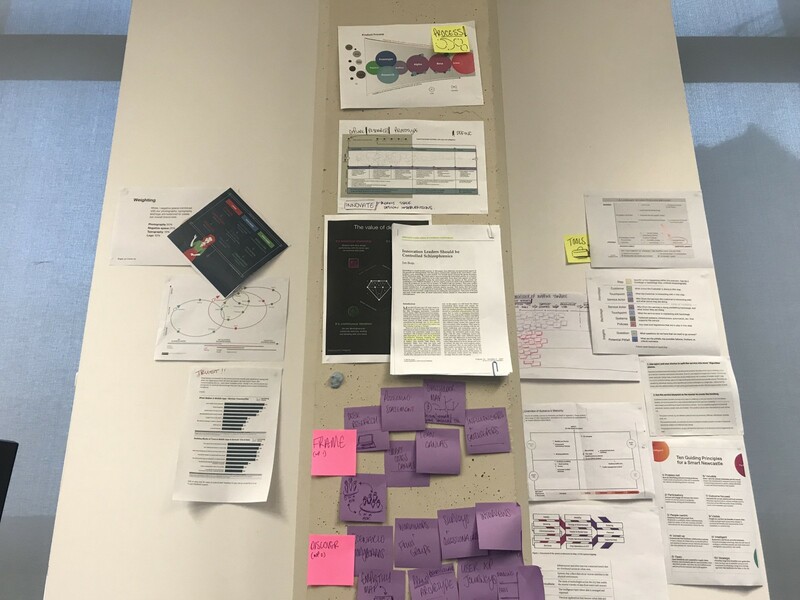 This acts as a stimulus for my own work, but I can use the wall to explain current ideas I have, bring a team member over to share and discuss. This approach is reflected in anything I do. It could be; taking notes from a standup or retrospective, sharing insight from user research, deconstructing the current provision of a service, wireframing new screens. Everything is visualised, everything is posted up, everything is shared. Take a deep breath, relax, take every day as it comes, and enjoy the process! I’d love to hear from those who have had a similar experience; how did you start? how did you adjust? Design Thinker and Doer! Member of the Wakanda Social Club!